WooCommerce Product Table doesn’t officially support composite products, product bundles and grouped products. If you use the plugin with these types of products then each product will be listed individually in the table, and won’t be grouped. You may also find that incorrect information appears in the add to cart column. It’s not possible to purchase composite, bundled or grouped products from directly in the product table. 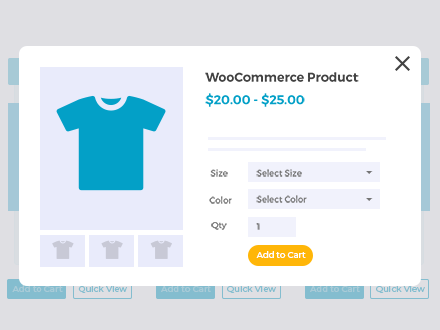 Instead, we recommend using WooCommerce Product Table with our other plugin – WooCommerce Quick View Pro. 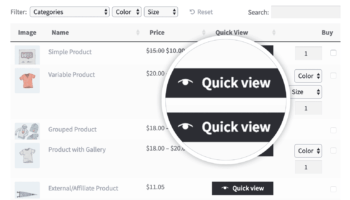 This allows customers to view the products in the table and click on ‘quick view’ links or buttons in order to buy composite, bundled or grouped products from a quick view lightbox. Sell composite, bundled and grouped products in a quick view lightbox. List the products individually in a table, and remove the add to cart column so that people can click through to the single product page. They can view the composite/bundle/group options on the single product page and purchase from there. Switch to using normal product variations for the different options instead of bundling separate products. Alternatively, you could add different options using the official Product Add-Ons plugin, which we fully support. Create a separate category for each product grouping and use our plugin to list all the products from that category in a table. Customers can then select all the products they require from the group/bundle and add to the cart, without having to use composite/bundled products.